Which Appetite Suppressant is Best? The number of various appetite suppressants that are sold online is overwhelming. Some really work, some don't. How can you know which suppressant is the best? Reading through customer reviews can give you a few generic clues, having said that, it might be useless because everyone's body is different and a hunger suppressant that works for a certain person may not work for you. It is probably the best to try out a number of hunger suppressant products and see which one is for you the best. Just make sure that when you're shopping for an appetite suppressant, the seller offers 30-day money back policy. Read the small print to make sure the vendor will refund shipping charge. We provide 60-day FULL refund policy on our Skinny Piggies appetite suppresssant nutritional supplement to make sure that you can give it a try and see how well it works for you. Where to Buy Appetite Suppressant? What Appetite Suppressants Are Fda Approved? What Are Fiber Gummies Good For? How Many Fiber Gummies Should I Take? Are Fiber Supplements Soluble or Insoluble? How to Buy Fiber Supplements? Which Fiber Supplement is Best for Constipation? Do you like eating tasty meals but also would like to burn fat? Losing body fat is about maintaining a negative caloric balance which means almost certainly you may be hungry at all times. Fortunately, there's a new product that can help you: Skinny Piggies. What is it? Let's take a look at weight-loss. Before we talk about what Skinny Piggies natural appetite suppressant gummies are, let's see what is required for weight loss to occur. 2) A diet that's enjoyable, so that you can stick with it over time. Sad to say, many diets skip one or more of these items. To actually see better success with your weight-loss program, it's imperative that you eat less calories than you burn throughout your day. You may do that in one of two ways: boost your energy expenditure through added exercise or cut down your food intake. Doing both of these is ideal! If only weight loss were this easy! Although cutting back on your calories can seem easy peasy, in practice your sugar cravings will keep you dreaming about sugar snack the whole day. You don't need to give into sugar binges. Skinny Piggies are tasty natural appetite suppressant gummies that naturally help curb your appetite, meaning that your cravings will be soothed without you cheating on your diet. Appetite is primarily controlled in two things: caloric intake and the stretch in the stomach. After you eat a meal, your stomach fills up and the stomach stretches. This makes you feel full and you don't feel hungry anymore and will stop eating. Take a Skinny Piggy approximately 30 minutes before your meal with a large glass of water. When the Skinny Piggy gummy enters your stomach, it absorbs the water and expands into a gentle gel. This gel takes up space in the stomach and alerts your brain that you just ate a good portion of food. A half hour later and you are ready to eat your desired food! At this point, the gel is still in your stomach and you are partly satisfied which will help you eat a smaller sized portion and still find yourself being full and satisfied. Eat one Skinny Piggy and you will eat fewer calories, avoid carb cravings and enable your body to be in fat burning mode . This way you can combat appetite and keep eating less, all without seeming like you're dieting. The soft gel allows the stomach to empty much slower leaving you feel full much longer. The sooner you feel full, the less likely you will continue eating and that allows you to achieve a reduced caloric intake. The viscous gel slows down the digestive function of sugars and carbohydrates which in turn flattens the blood glucose level. By preventing quick changes in the blood glucose you avoid those unbearable cravings too. When you prevent blood glucose spikes by slowing down the digestion of carbs you are preventing it from being accumulated as fat and that then activates your body to burn its existing fat. The slower the digestion the longer your body remains in fat burning mode. Genuine Ingredients: Unlike other fat-loss pills, it's easy to pronounce every ingredient in our supplements, knowing that you're eating only high quality ingredients. Delicious Flavor: Few dietary supplements actually taste great, and none have the same taste of strawberries, meaning that our gummies are a pre-meal treat you will look forward to. Wholesome Nutrients: On top of helping you curb appetite, they also support the healthy nails and help your skin glowing. No Harsh Chemicals and Stimulants: Using a dietary supplement without caffeine and that's why you may take it even before going to sleep, and our formula without irritants means that the gel is OK with sensitive stomachs. Losing body fat might be a challenge, but our product is ready to make the process a little bit easier for you. You will love the taste of these gummies, so forgetting to take them every day won't be an issue. 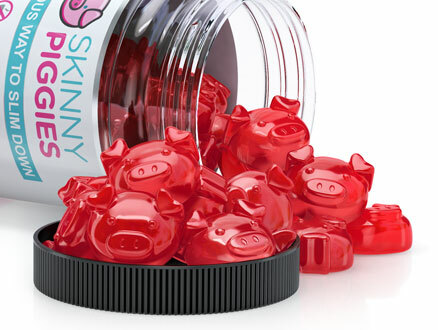 Simple to take and surprisingly fulfilling, Skinny Piggies are supplement gummies that is delicious and fun to take.